Over the recent decades consumption of dairy has allowed several ancillary industry to flourish. Their demand for right packaging materials has tremendously increased the consumption of aseptic paper packaging in dairy products, thereby propelling the global market. The global market is also likely to be driven by the eco-friendly nature of these packaging materials. According to the research report, the global aseptic paper packaging market is expected to be worth US$13,611.0 mn by the end of 2025 from about US$8,894.8 mn in 2017. During the forecast years of 2017 and 2025, the global market is estimated to surge at a CAGR of 5.5%. Globally, the aseptic paper packaging market has been segmented as bleached and coated unbleached paperboard, by paper type. Coated unbleached paperboard segment for aseptic paper packaging dominates the market, by paper type, with an estimated share of a little over 60% by value. By thickness type, the global market has been segmented into less than 240um, 240 to 260um, 260 to 280um, more than 280um. 240 to 260um segment accounts for highest market share of 32.4%, in 2017 by value. More than 280um segment is expected to register a healthy CAGR of 5.6% over the forecast period. Less than 240 um segment and 260 to 280um segment cumulatively to account for a market share of over 40%, in 2017, by value. By packaging structure type, the global market has been segmented into 3 layer, 4 layer, 6 layer and others. 6 layer segment is estimated to account for a market share of 35.7%, in 2017 by value. 3 layer segment is anticipated to register highest CAGR of 5.9% over the forecast period. 4 layers and others segment to cumulatively account for over 40% of the market share, in 2017. By packaging type, the global market has been segmented into flat top, gable top and others. Flat top segment is estimated to account for majority of market share of little less than 50%, in 2017. Gable top segment is anticipated to register highest CAGR of 5.7% over the forecast period. By end-use industry, the aseptic paper packaging market has been segmented into dairy products and beverages type. Dairy products has been further segmented into milk and yogurt. Milk sub-segment is anticipated to account for majority of market share of little less than 90%. Yogurt sub-segment is expected to register CAGR of 4.6% over the forecast period. Beverages type is further segmented into fruit juices, carbonated and alcoholic beverages. Fruit juice sub-segment is expected to account for a market share of over 80%, in 2017. Carbonated sub-segment is anticipated to register healthy of 5.0% over the forecast period. The global aseptic paper packaging market has been segmented into five regions such as North America, Latin America, Europe, Asia Pacific region (APAC), and Middle East & Africa (MEA). The APAC region is projected to register the highest CAGR of 6.2%, over the forecast period as the food and beverages in dire need of packaging shows steady growth. The region represents the highest absolute opportunity of an estimated US$5,247.6 mn by the end of 2025. North America and Europe region cumulatively is expected to account approximately half of the market share over the next decade. Key players in the global aseptic paper packaging market include Tetra Pak International S.A., Refresco Gerber N.V., Nippon Paper Industries Co., Ltd., Nampak Ltd., SIG Combibloc Obeikan (South Africa) (Pty) Ltd., Mondi Ltd., Polyoak Packaging Group (Pty) Ltd., Amcor Limited, Elopak SA, IPI s.r.l., Uflex Ltd., Ducart Group, Weyerhaeuser Company, Evergreen Packaging Inc., Clearwater Paper Corporation, TidePak Aseptic Packaging Material Co. Ltd., Greatview Aseptic Packaging Co., Ltd., Gammagroup Industriegüter Handelsges. mbH, Lami Packaging Co. Ltd. This report provides forecast and analysis of the aseptic paper packaging market on global level. It provides actual data of 2016 along with estimated data of 2017, and forecast data up to 2025 in terms of revenue (US$ Mn) and volume (Tonnes). The report also includes macroeconomic indicators along with an outlook on global aseptic paper packaging market consumption pattern across the globe. It includes drivers and restraints of the global aseptic paper packaging market and their impact on each region during the forecast period. The report also comprises the study of current issues with end users and opportunities for aseptic paper packaging market manufacturers. It also includes value chain analysis. In order to provide users of this report with comprehensive view of the market, we have included detailed competitiveness analysis and company players with their SWOT analysis and strategy overview. The dashboard provides detailed comparison of Global Aseptic Paper Packaging Market manufacturers on parameters such as operating margin, total revenue, product portfolio, and what we call ‘innovation scale’. The study encompasses market attractiveness analysis by paper type, thickness type, packaging structure type, packaging type, end-use and region. The report includes consumption of aseptic paper packaging market and the revenue generated from sales of aseptic paper packaging market across the globe and key countries. By paper type, aseptic paper packaging market is segmented into bleached and coated unbleached paperboard. By thickness type, aseptic paper packaging market is segmented into less than 240um, 240 to 260um, 260 to 280um and more than 280um. By packaging structure type, aseptic paper packaging market is segmented into 3 Layer, 4 Layer, 6 Layer, Others. By packaging type, aseptic paper packaging market is segmented into flat top, gable top and others. By end use type, aseptic paper packaging market is segmented into dairy products and beverages. Dairy products is further segmented into milk and yogurt. Beverages type is further segmented into fruit juice, carbonated and alcoholic. Market numbers have been estimated based on extensive secondary and primary research, average pricing of aseptic paper packaging market by paper type and the revenue is derived through regional pricing trends. Market size and forecast for each segment have been provided in the context of global and regional markets. The aseptic paper packaging market has been analyzed based on expected demand. Prices considered for the calculation of revenue are average regional prices obtained through primary quotes from numerous regional aseptic paper packaging market manufacturers, suppliers, and distributors. All key end users have been considered and potential applications have been estimated on the basis of secondary sources and feedback from primary respondents. Country demand patterns have been considered while estimating the market for various end users of aseptic paper packaging market in the different regions. Bottom-up approach has been used to estimate the Aseptic Paper Packaging Market by regions. Global market numbers by paper type, thickness type, packaging structure type, packaging type, end-use have been derived using the bottom-up approach, which is cumulative of each country’s demand. The same has also been validated from top-down approach. Company-level market share has been derived on the basis of revenues reported by key manufacturers. The market has been forecast based on constant currency rates. The report provides detailed competitive and company profiles of key participants operating in the Global market. 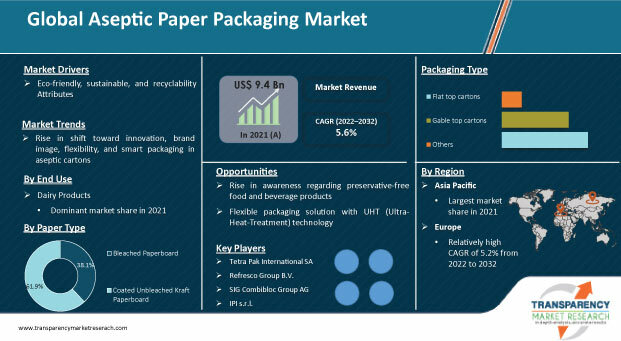 Key Players of the global aseptic paper packaging market are Tetra Pak International S.A., Refresco Gerber N.V., Nippon Paper Industries Co., Ltd., Nampak Ltd., SIG Combibloc Obeikan (South Africa) (Pty) Ltd., Mondi Ltd., Polyoak Packaging Group (Pty) Ltd., Amcor Limited, Elopak SA, IPI s.r.l., Uflex Ltd., Ducart Group, Weyerhaeuser Company, Evergreen Packaging Inc., Clearwater Paper Corporation, TidePak Aseptic Packaging Material Co. Ltd., Greatview Aseptic Packaging Co., Ltd., Gammagroup Industriegüter Handelsges. mbH, Lami Packaging Co. Ltd.